When I read Yolanda Elizabet's latest post at Bliss about recently painting her home, I was reminded that this month marks 8 years since we came to own Rosehaven Cottage. 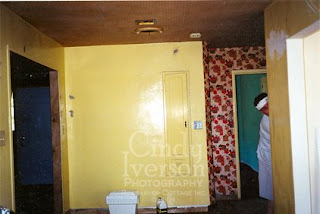 I also was reminded that I haven't shared our journey of restoring Rosehaven Cottage here on the blog. We knew we were supposed to live here when we saw the little house back in the summer of 2000. Even though it was in desperate need of restoration and repair, we could see what it could become. Although the home was built in the late 1940's, we are only the third owners, so much of the original construction was still there waiting to be brought to life again after years of neglect. 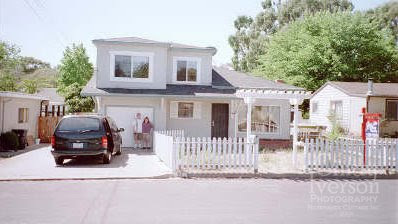 It had only been renovated once in the early 1960's when a second story was added. Other than that, for better and for worse we were getting everything pretty much untouched. The home was built on a former vineyard that was subdivided. Each lot in the subdivision was sold at various times over about a ten year period, with each buyer custom-building their home different from the rest. So our home was one-of-a-kind from the start. 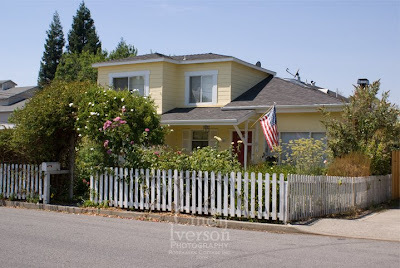 When we closed escrow, there was no vegetation in the gardens--just a white picket fence and pergola (which we fell in love with right away). We received the key on the last day of July 2000. During the blistering summer heat of August, we embarked on making the house liveable so we could move in. With crowbars and hammers in hand we naively thought we could renovate everything in about 3 weeks. Boy, were we naive! Above left: The downstairs bathroom before we did anything to it. It took 3 months of literal blood, sweat and tears from Hubby, my gifted craftsman of a brother, and me just to get the house to a point where we could move in! My mom even came up and pitched in helping us to sheet rock and tile the downstairs bathroom. Everyday, I would drive 45 minutes from our former town and begin work in the non-air-conditioned house. My brother (a college student off for the summer) would join me. Hubby would go to work, put in an 8+ hour day, and then join us in the evening to put in another 4-5 hours of hard labor. We'd leave around 11 or 12 o'clock at night, drive back the 45 minutes to where we were staying with my sister and her family, shower, and crash for the night. Above left: The original kitchen. Nothing was salvageable and we had to take everything down to the studs. Above right: The kitchen after renovation. We wanted to keep it true to the period of the home even though it was new construction. Hubby and I acquired matching pairs of canvas painter's overalls that became our daily uniforms. I quickly learned to not care whether I was seen in public without makeup, and the three of us would often descend on an eating establishment still dressed in our construction attire. Many times it was in a sit-down establishment. All pride goes out the window when you're hungry and exhausted. We did have an electrician come in to bring the wiring up to code. And a plumber came to replace the main supply and waste lines under the house. But the rest of the work was performed by the three of us. It was less expensive that way and we'd get "more bang for our buck". Above left: The eat-in kitchen area before (that's Hubby peeking around the corner). 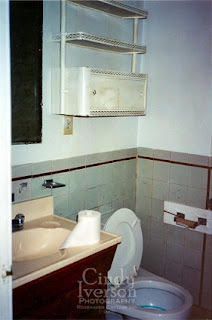 The little cabinet is the original pull-down ironing board that we happily restored. Above right: The eat-in kitchen are now. The dinette set is a vintage set that was given to us from the neighbor across the street when she was cleaning out her childhood home. About Halloween 2000, we deemed the house ready for us to live in it because we had an operating downstairs toilet and a shower. We still didn't have a kitchen sink. We did dishes in the bathtub. The sink got put in a month and a half later by a very kind and gracious man, Wayne, in our new congregation at church that found out we didn't have a kitchen sink yet. He insisted that we needed to have a kitchen sink before Christmas. He wouldn't take "no" for an answer, came over one evening, and installed everything. He did it all for a handshake and a "thank you". We are forever grateful to Wayne for making the first Christmas in our home one where we could do the dishes in the kitchen sink. We were far from being done with the restoration. Over the next 6 years, we were involved in doing some phase of the renovation. We lived with sheet rock dust for so long that it's kind of odd not to have it around anymore. Over those 6 years, Hubby learned to cut tile and I learned to set tile. Hubby learned to hang sheet rock. I learned how to mud and tape sheet rock and then texture it to look like the old plaster on the original walls. We learned about framing and basic electrical. We figured out how to lay hardwood floors that would match the original hardwood floors. 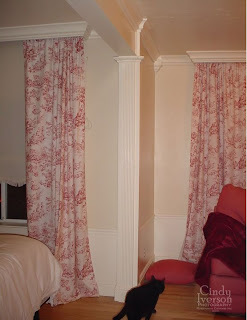 Hubby learned to cut trim and moulding with exact precision (see the photo of our master bedroom at left to see his gorgeous handiwork). And I learned the blessings of paintable caulk. And so much more! As I look back over the last 8 years, I don't have many regrets. 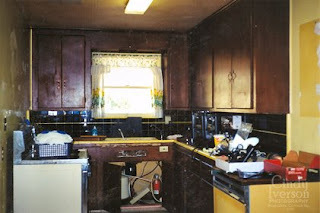 Don't get me wrong... home restoration and renovation is not for the faint of heart, by any stretch of the imagination. But we've learned and grown so much. The experience has helped me to finally put down roots somewhere, because I have put myself into almost every inch of this house. Some people wonder why we chose to name our home. This is why. Because it deserves a name after everything we've been through together. It's like a member of the family--a home named Rosehaven. Gorgeous job Cindy. It looks like a delicious collage of heritage meets retro while all confined with a Tardis-sized cottage. Incredible effort and thanks for sharing the pics. 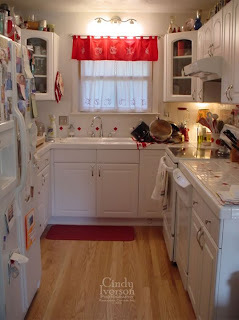 Cindy I love this post about your sweet home. I was hoping for more photos... like the boom-boom room. Well, Joanie, the "boom boom room" has been tamed quite a bit and is no longer bright green. It is now a lovely and subdued combo of Macadamia White and Currier Creme so that I have better reflected light when I'm working on art and photography. The tropical print is still on the upper third of the walls so it is now "The Tiki Room". And don't forget to mention the best girl grip who should get an award for the tile in the downstairs bathroom -- Mom. It's gorgeous Cindy. Next time we come down, we want to come and see it! You have done a wonderful job. The transformation is very nice. It was a house now it's a home. Cindy, what a beautiful house. All your hard work has obviously paid off, in great dividends. I LOVE!!! heritage homes. And I love your kitchen. There are so few older homes left here, now we have stacked mushroom houses replacing all the beautiful old cottages. [ 3 and 4 story, stuccoed, boxes to maximize the view of the ocean]. Cindy, that is a wonderful story. 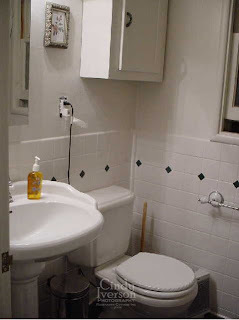 When I bought my house, I never thought to take the 'before' pictures. I just thought, "I hate this," and proceeded to change it. Now I can hardly remember. Thank you for sharing the history behind Rosehaven Cottage. The pictures tell it all . . . you have created a "haven" and "refuge" - just beautiful! What an amazing transformation! It's such a lovely home and I love seeing the before and after photos! Great work! I will have to come visit your cute place someday. I was not too surprised to know you named your house...maybe it runs in the family, since I name all my vehicles, even my bike (Debbie). I love what you have done with your little house. It looks fabulous now. Thank you for sharing. Hia Cindy, I'm caught up with you now- what a lovely home you have and so much work has gone in to it. We were naive when we bought our first home whn I was 18. The first house we looked at didn't even have an indoor toilet! We thought all houses did and it not being mentioned on the details was just an oversight. LOL Luckily we bought a lovely house and stayed 10 years. I haven't put much into this house as we were planning to move but the sale didn't happen. We then decided to stay until the children finish school and then move, possibly even emigrate. Yes caulk- wonderful stuff! The worst job for me is the silicon sealer- I am awful at it and manage to muck up my hands every time and it takes ages to get off. Beautiful home Cindy. :-) Thanks for sharing. Wow! This was amazing to read. I've always, well, for the last couple of months anyway, have wondered about where you live. So interesting! You've come a long way. A lot of hard work but well worth it. 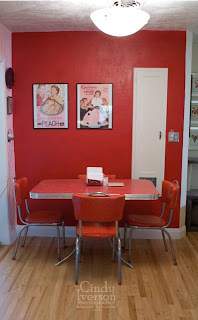 I loved watching the transformation of your house (and it's continually updated touches). It's been quite inspiring! It's beautiful, Cindy. It has character, even more now than it did. Good job!